The way to my man's heart generally involves some kind of chocolate biscuit cake, although all cakes and biscuits are appreciated. 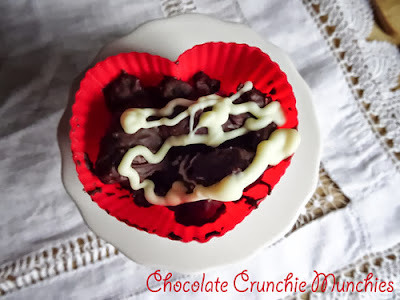 These little Chocolate Crunchie Munchies are, not only a decadent and delicious morsel to munch on with your coffee, they are also a frugal make. Now that is bound to please your loved one! I came home on Friday night and had a bit of a craving for something chocolatey, I knew there were no chocolates in the house but there was a bar of Rylands Dark Chocolate. I get this chocolate at the supermarket, it is about 89p for a 200g bar and tastes very much like Bournville chocolate. It's not in the league of specialist chocolate for eating, but it is excellent for baking and sweet making. So I had the chocolate, now I needed to find something to mix with it. 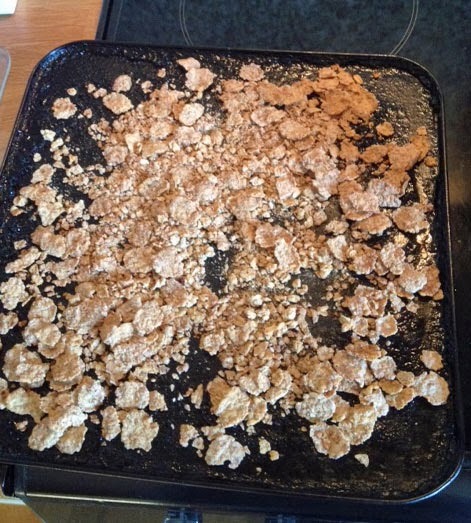 I rummaged around and found the end of a box of Special K, the flakes had gone a bit soft and chewy, but there is an easy way to rescue cereal, by putting it in a hot oven for 5-10 minutes. You need to use it up pretty quickly after that, but it crisps it up beautifully. As I was putting the oven on for supper anyway, this wasn't going to cost any more in fuel. I also found a bag with a few Amaretti biscuits in it and some sultanas. 1. 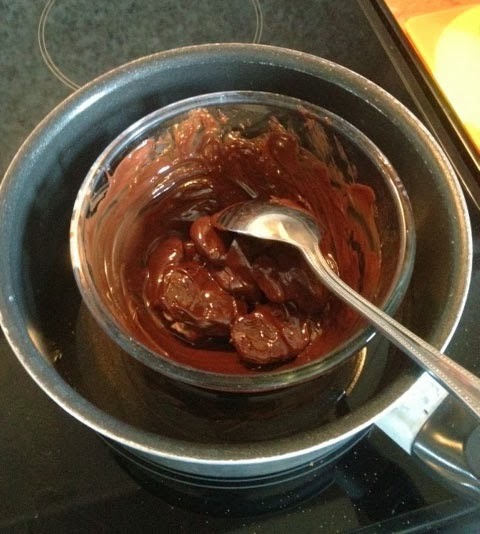 Break up the chocolate and put it in a bowl with the butter, over a pan of hot water. Melt the chocolate being careful not to get any water into the chocolate or it will granulate. 2. Stir in the cereal crushed biscuits and sultanas and spoon into paper or silicone cases. 3. Put in the fridge for about 30-50 minutes. 4. Using a clean bowl, melt the white chocolate and put into a piping bag. 5. Drizzle the white chocolate over the Crunchie Munchies and return to the fridge for 10 minutes to set. These little chocolate bites definitely hit the spot, you can adapt the recipe for any type of cereal or mixture of cereal and crushed biscuits, add nuts or seeds, smarties, M and Ms or anything that you like. Great for kids to make. I received the heart shaped silicon cupcake cases in a lovely parcel from Dunelm Mill. I find that Dunelm Mill is a great place to get all your baking equipment, the prices are much cheaper than some of the specialist stores and there is a wide range of different products. I like to pick up items for food styling as well. As you can see I received a silicone madeleine mould, some large silicone cupcake cases, some silicone flowerpots and a Macroon Baking Set. The Heart Shaped Cupcake Cases are the first item I have had a chance to use but I am really excited about the Flower pots and the Macaroon Baking Set. I have made Macaroons before but they weren't very even and the set contains a baking mat which will keep my macaroons all the same size. As this is a frugal recipe I'm entering it for Credit Crunch Munch the blog event run by Fuss Free Flavour and Fab Food 4 All. This month it is Elizabeth's Kitchen who is hosting the challenge. I'm also adding this to Treat Petite, a NEW challenge from Cakey Boi and the Baking Explorer. This month the challenge is for any small cake or treat and The Baking Explorer is hosting. I was sent these baking items by Dunelm Mill, I was not paid for this post and all my views are my own. Love these Janice, simple and delicious, you could even put in some chopped glace cherries to ring the changes:-) Thanks for entering Credit Crunch Munch with such a yummy treat! Such a nice name to say, crunchie munchies! I love that you made these from bits and bobs you already had. Heehee, I love your naming of these sweets! I love that they're so versatile too and frugal. Thank you for sharing with Credit Crunch Munch! Crunchie Munchies! I can't stop saying it!! They look very delicious and I love how adaptable they are!! Glad you all enjoyed the name, it was fun to make it up!